Overtaking a truck or an 18 wheeler on the highway is risky business. You always run the risk of getting hit or crashing in to an oncoming vehicle. And since the number of trucks on the highways is only going to increase thanks to more global shipping, there are a few things that can be done to help facilitate the weary traveler. Like building a see through truck. Now Samsung has been stepping up it’s game with the release of it’s new phones and tablets for years but now they’re looking to facilitate those that might not even buy their products. 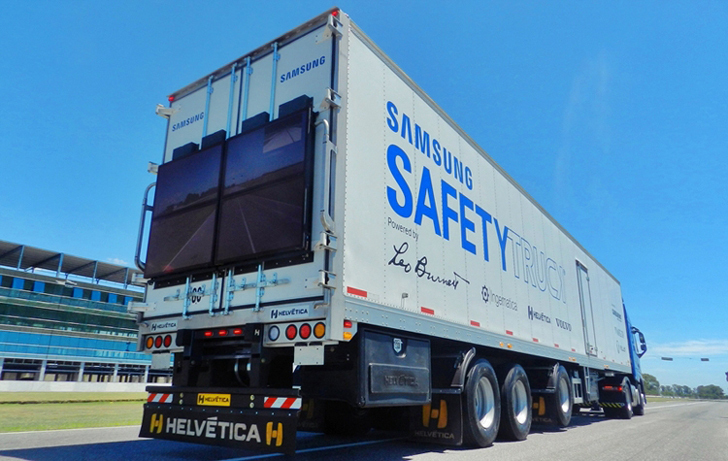 In Argentina, a Samsung truck has been ‘Invented’ that allow drivers to see through to be wary of incoming vehicles. The problem of accidents due to unforeseen traffic is quite acute in Argentina, one person every hour dies due to it and the number is increasing. A live feed is captured by high quality cameras mounted on the front of the truck and is transmitted to the four giant screens on the back. This is especially useful in the dark when the driver of a small vehicle in the back has no idea what is in front of the truck. Samsung is trying to get leading truck fleets in the world to adopt this technology such as Argentinian company Ingematica. Let’s hope they succeed.